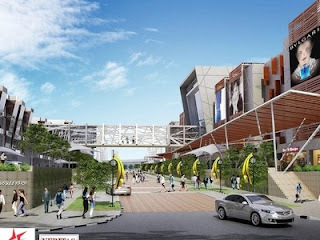 Artist impression: The 86 shop office units will be connected to the shopping centre via a covered pedestrian sky-bridge. The Andaman Group and the Selangor State Development Corporation (PKNS) officially launched the Sentral@Bangi CBD project at the Andaman Bangi sales gallery in Bandar Baru Bangi recently. Located along Persiaran Kemajuan, Sentral@Bangi CBD is on 5.44ha of leasehold land and comprises two phases. The first phase is a commercial centre development while the second phase will be a mall. The eight-block commercial centre offers 86 shoplots. The mall is expected to be the recreation, leisure and entertainment hub of Bangi. The price range for Sentral@Bangi CBD commercial and business centre development is from RM2.15mil to RM5.5mil per unit. All units come with individual lift (first of its kind in Bangi). Andaman Group sales and marketing director Datuk Vincent Tiew said they had received good response for the project. “Around 70% of the shoplots and offices have already been sold,” he said. “Sentral@Bangi CBD is a comprehensive commercial and business hub, in that it not only offers shops and offices for sale. There is also a modern shopping centre with a proposed cineplex and a bowling centre. This is truly, genuinely the last most prime commercial land in Bangi,” said Tiew. The 86 shop office units will be connected to the shopping centre via a covered pedestrian sky-bridge. The space between the shops and shopping centre will feature a street mall promenade with lush green landscaping, creating a sustainable eco-friendly ambience for visitors and shoppers. From Kuala Lumpur, the Sentral@Bangi CBD is accessible via the North-South Expressway, exiting from the Kajang interchange. It is also closer to the neighbouring Kajang and Semenyih towns with direct connection to Putrajaya and Cyberjaya. Travelling time from the Sungei Besi toll to the Bangi town centre is a mere 10 minutes’ drive.